Blackfen’s oldest pub is re-opening on Thursday after a refurbishment. But who was George Staples (the pub name since 2008)? George William Staples was born in Knockholt, Kent in 1791. In 1814 he married Jane Maria Godsave and they had three children. George worked as an inn keeper and a wood dealer. He rented woodland in Bexley and was the landlord of the Blue Anchor pub in Bridgen 1838-1841. In 1838 George Staples bought a cottage on the north side of Blackfen Road which he rented out. In 1845 he built the Woodman Inn (naming it after his occupation) and he lived there with his wife, a domestic servant and two lodgers. He also built more cottages alongside the pub which were rented out, providing an income for his family. George Staples died on 24 January 1859. His widow Jane and their son William continued to run the Woodman for some years afterwards. Their son Michael ran the Tower Inn (later the Railway Tavern) in Bexley village. In 1931 the Woodman Inn was rebuilt to serve the large number of new residents who had just moved to the area. The Woodman in 1931, shortly before it was replaced by the new Woodman Inn. The history of the Lamorbey Estate is closely intertwined with the history of Blackfen. In 1608 the Goldwell family’s Lamorbey estate included a 54 acre farm at Blackfen. This later got passed around as fortunes rose and fell. In the 18th century landowners bought up parcels of land to convey their wealth, political power and social status. William Steele enhanced his Lamorbey estate by buying up land in Blackfen in 1745. But it worked both ways: when Robert Owen Jones died and his Blackfen home was put up for auction in 1861 a key selling point was the fact that the property adjoined big estates like Lamorbey and Danson. Estate agents were at work even then! And when Blackfen’s Church of the Good Shepherd was built in 1967 it was Lt-Col G. I. Malcolm of Poltalloch (a descendant of the Malcolms of Lamorbey) who laid the foundation stone. Glamorous landlords! One of Blackfen’s farms, on the east side of Days Lane, was owned from the early 1800s by the Townshends, including the politician John Robert Townshend, 3rd Viscount and later 1st Earl Sydney. The family also owned fields in what is now the Boundary Road area. They lived at Scadbury in Chislehurst and later at Frognal House. All the land was sold off as part of the vast Frognal and Scadbury estate in September 1915. Bexley’s Local Elections take place on 3 May. Use your vote! This year’s 100th anniversary of votes for (some) women reminds us that we didn’t always have the opportunity. We don’t have any Suffragettes in Blackfen but Dame Ethel Smyth, OBE lived in nearby Sidcup and she devoted herself to the cause of women’s suffrage; she was also a female composer in a musical world dominated by men, and a prolific writer. As the community in Blackfen developed in the 1930s a number of political organisations were established as the Labour Party and trade unions were growing in importance and the Conservative Party reacted to their rise. 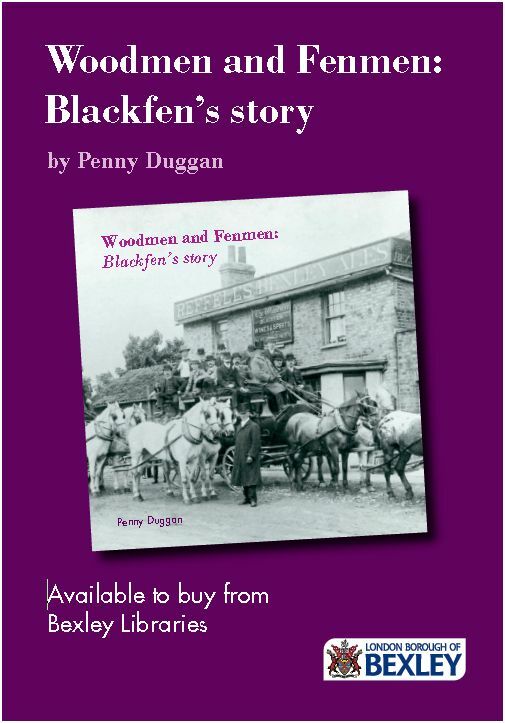 The Blackfen Constitutional Association began with a meeting at the Woodman in April 1932. Mrs Packham, Chairman of the women’s branch, proved herself a great leader, starting with 15 members in early 1932 and almost 1,000 members by the annual dinner in November 1937. They held meetings, socials, whist drives, outings and talks. Many of the early residents of Blackfen, who had often moved out from London, wanted to improve their lot in life through politics and trade unions. In 1931 there was no Bexley Labour Party group and John Cronin became committed to establishing one (he later became a Councillor and Mayor). The Ridgeway Residents Association tried to get people elected to the local council. The Ridgeway Estate became known as ‘Little Moscow’ because of all the Labour posters in the windows of houses. The Blackfen Co-operative Men’s Guild and the Blackfen Co-operative Women’s Guild (men and women were always separate at that time!) met in the hall above the RACS Stores. They held horticultural shows, cake-making competitions and dinners. I always think this must’ve been quite an exciting time in Blackfen’s history. Thousands of families had arrived in a new place in a very short space of time. They all wanted a new life and they worked together to make it happen. Doris Shipway was born in 1918 and lived in Burnt Oak Lane until she sadly passed away in 2014, but not before she had seen as much of this earth as possible. For anyone interested, here is a site put together of a collaboration of her travels. Doris enjoyed travelling and photographing her trips. When she died, she left about 50 year’s worth of slides and various related documents. These have all been organised, scanned and publish here: https://wdeod.com/ What a lovely thing to do!